Fantastic job. Congrats Team Monty!!! great work and many many thanks to all involved!!! Thank you very much to all involved for these Angels! Many thanks Simon, I'm starting to suspect that there is now end to this present that keeps giving the gift of flight to us. You and all the modders combined never cease to amaze me with what your capable of producing, and the speed with which its produced. Thank you very much guys for your continued efforts in constantly updating BAT, really appreciated. As always things went smoothly and all appears to be good my side. Joining the celebrations and I have nothing more to add to all the other voices of gratulations! 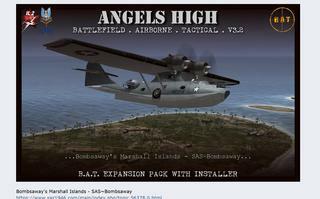 Just one question: Is this PBY Catalina with the wheels shown on this image from the new expansion also included? I just can find the normal version without wheels in the game? cant find my socks.....bloody hell theve just been blown off.many thanks guys to all involved,it just gets better and better,absolutley wonderful stuff.kev.